Exactly a month ago I posted the question on my blog: “Would you stick pins in a tyrant’s effigy?” This generated a lot of discussion and, in the light of witches recently publicly casting a spell against Donald Trump, it seems my original question was ahead of the trend. I thought it would be a good idea to comment on the responses I got and on the topic of cursing in general. 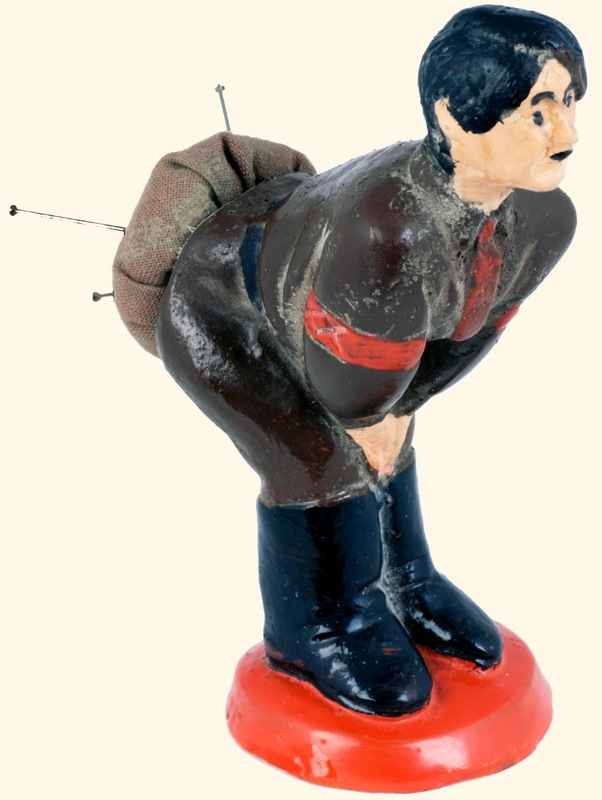 The example I gave in my original question about sticking pins in a tyrant’s effigy was that during the Second World War, pin cushions were made in the likeness of Hitler, encouraging people to stuck pins in the Nazi 's bottom and wish him ill. You can see a picture at the top. It comes from The Museum of Witchcraft and Magic, in Cornwall. You can see it for real at the MWM and you can find out more about it on its website. To summarise the overall sentiment, I went through the responses I got to the question. Seventy-five individuals responded with an answer that could be classified as ‘yes’, ‘no’ or ‘undecided/only to heal’. Of that 75, 38 said that they would stick pins in a tyrant’s effigy, 21 said they definitely would not, and 16 said they were undecided or would only stick pins in an effigy for healing. Adding the number of those who wouldn’t prick a poppet to those who were undecided or would only do it for healing gives a figure of 37. To sum up, more people in the admittedly small survey would happily stick pins in a tyrant’s effigy (38) than would not or might not (37). Obviously that was more of a quick vox pop than a scientific sociological study, but when I counted up the results I tried to make sure there was no duplication of entries. I also did not count replies that were not specifically answering the question, such as arguments between individuals, general remarks about politics, advice about how to make poppets and the best things to stick in one (blackthorns or pins, by the way). I'd even use a hammer to ensure they were in properly. It's all down to personal ethics I guess and while I'm happy to live in peace and harmony with all, all may not be happy to live in peace and harmony with me, in which case I will defend myself and those I love! ‘Do what you will but harm none’ [The Wiccan Rede] comes to my mind all the time. What is less harm: stopping one tyrant bringing war and death to innocents or allowing said tyrant to cause unimagined horrors? Hmmmm not sure. Take for example a person whose negative behaviour is aggravated by mental and physical anxieties and stress. If you employ magic that increases these symptoms are you not partly responsible for escalating those negative behaviours? No. Energy goes where attention grows. Remove energy from negativity by focusing on positivity. Remember that what you give out returns back threefold. I do have one rule before [I] do anything drastic....I give myself (when possible) at least a day or two to calm down, think it through...and if the desire is still, or the threat is still there...well screw it...I'm goin in. One of the comments above refers to the Wiccan Rede, which states: “An it harm none, do what ye will.” Another mentions threefold return. As an eclectic Gardnerian Wiccan who also practises traditional witchcraft and likes to get to the bottom of things (pun intended), I thought I’d delve into the origins of those concepts. The Wiccan Rede is found in the Gardnerian Wiccan Book of Shadows and dates back to the mid 20th century. It was compiled by Gerald Gardner, the father of modern Wicca, and his High Priestess Doreen Valiente. The word “Rede” means “advice” rather than “rule”, but many Wiccans take the concept of never doing harmful magic very seriously. Obviously not all witches are Wiccans, but the general ethos of the Rede is quite prevalent in modern paganism. However, advice isn’t something that necessarily has to be rigidly obeyed all the time. Another term that is commonly mentioned in discussions about cursing is the “Law of Threefold Return”. Stronger than advice, that uses the world “Law” and is the idea that whatever you do magically will always come back to you threefold, no matter what you do to try to avoid the repercussions. This is another Wiccan concept, but was devised more recently than the Wiccan Rede. The Law of Threefold Return does not appear in the standard Gardnerian Book of Shadows. Luth Adams, in The Book of Mirrors, researched its origins and discovered that the closest that Gerald Gardner came to that in his writing was: “Learn, in witchcraft, thou must ever return triple.” That quote is from High Magic’s Aid, published in 1949, and could be read as the opposite of the way the Law of Threefold Return is currently understood. It could suggest that if, as a witch, someone does something to you, you should pay them back in kind threefold. However, Maxine Saunders stated that the Law of Threefold Return in its current form was being taught in Alexandrian Wiccan covens at the time of her initiation in 1964. So, it appears that the concept came into being some time after the BoS was compiled. It could have been a misunderstanding of earlier teachings or could simply have been something made up as a cautionary tale for novice witches that got taken too seriously. Those who following more traditional witchcraft paths tend not to be so reluctant to curse. Many believe that cursing is sometimes necessary or at least that learning how to curse is an important part of a witch’s training even if they never need to curse anyone themselves. Some go as far as to say that if you can’t curse, then you can’t cure. There is certainly no shortage of physical examples of traditional curses – including poppets with pins in them – in the MWM. Personally, I would never tell another witch that they must or must not do anything. I would advise thinking things through carefully before taking any drastic action though. As to whether I expect threefold repercussions from any magic I cast, or whether I prefer to pay others back threefold in kind, I leave unstated – and to be borne in mind by anyone who is thinking of crossing me. The picture of the Hitler pincushion is copyright the Museum of Witchcraft and Magic and is used with permission. Excellent, excellent post! I hope many others read this post and learn a little something. It became increasingly apparent that many witches do not know their history!